I once was asked - why I love bracelets so much. I stopped and thought for a moment. 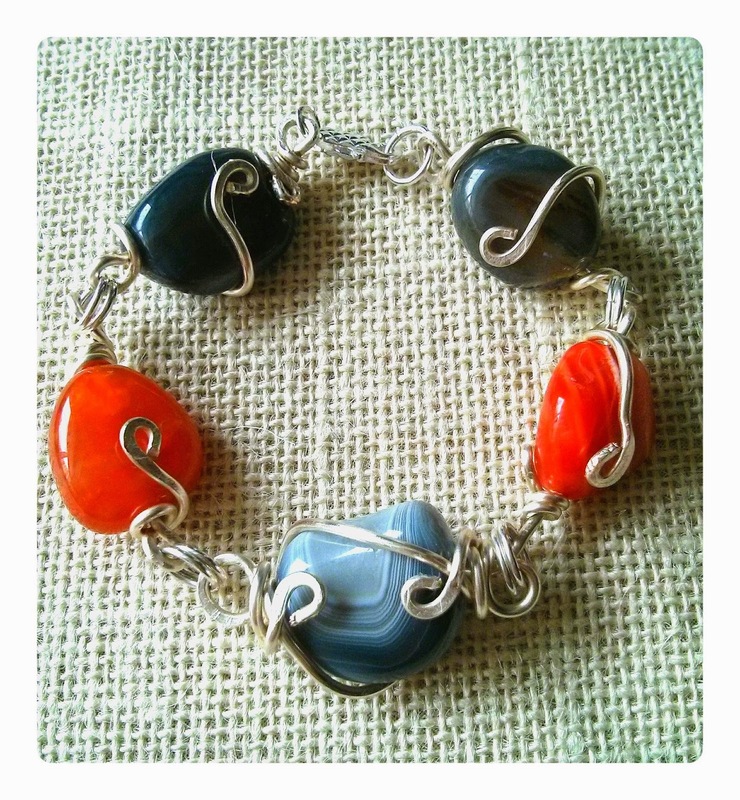 Indeed, although I do make rings, earrings and necklaces, I enjoy making and wearing bracelets more. And you know what I said? "Because it's the only piece of a jewelry which you can actually see on yourself without looking in a mirror". These Botswana Agate polished nuggets were in my stash for quite awhile. They looked so powerful somehow, so intense, that they scared me a little bit. I had so much respect for them that I dare not touch them. But today was different. Today I looked at them and said: "I can!" And I did. I like that stunning bracelet very much. I actually can feel a warm perception in my heart. Named for the area in Africa where it is mined, Botswana Agate is called the Sunset Stone because it retains sunlight and comforts people through dark, lonely nights. Agate is a powerful stone and Botswana Agate is a simply breathtaking stone that can combine shades of taupe, peach, opal white, brown, pink and gray. Every stone is different and some even appear to move as you view them from different angles. Botswana agate is sometimes called the "change stone" because of its property of helping one handle change in a positive way. It gently helps one make transitions of any kind in a way that change is not as difficult or painful as could be without it; it is a comforting stone. Relief from depression and/or grief is another property of Botswana agate. It helps focus on solutions instead of problems, and thereby increases creativity. It increases the power of one's intuition. This is the gemstone for people who are sensitive and lonely or easily hurt. It will help you have more self-satisfaction and protect you from hurt. The bracelet is almost 9'' long. Bead size varies from 18-24mm. Each bead is handwrapped in thick silver plated non-tarnish wire. 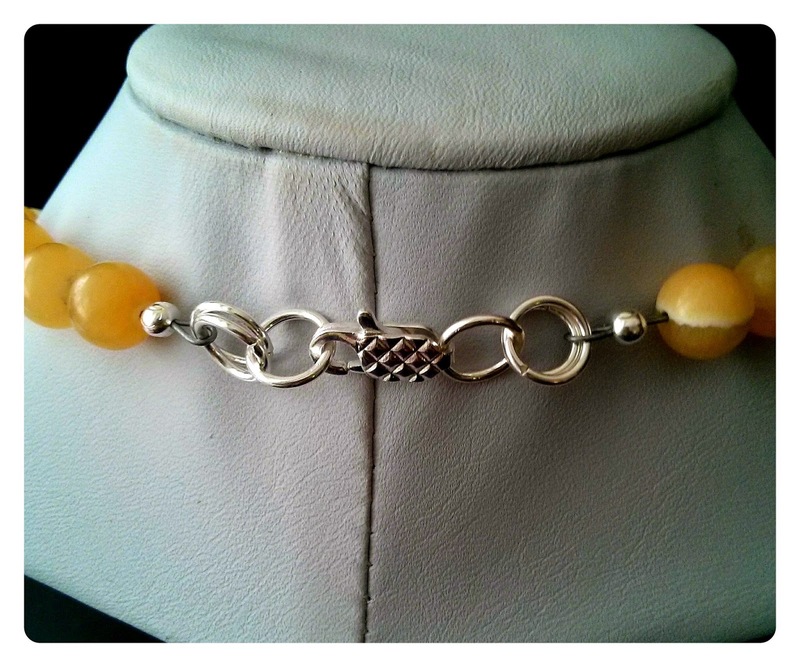 The bracelet is finished with shiny lobster claw clasp. The cost is only $62 + shiping and handling. Your bracelet will arrive to you in gift-ready beautiful package. To purchase this great beauty from secure PayPal web site, click on the button 'Buy Now' below. After the transaction is complete, you will be returned to this site. Thank you for you interest and happy shopping! Should you have any questions, please do not hesitate to contact me. I love hearing from my customers! 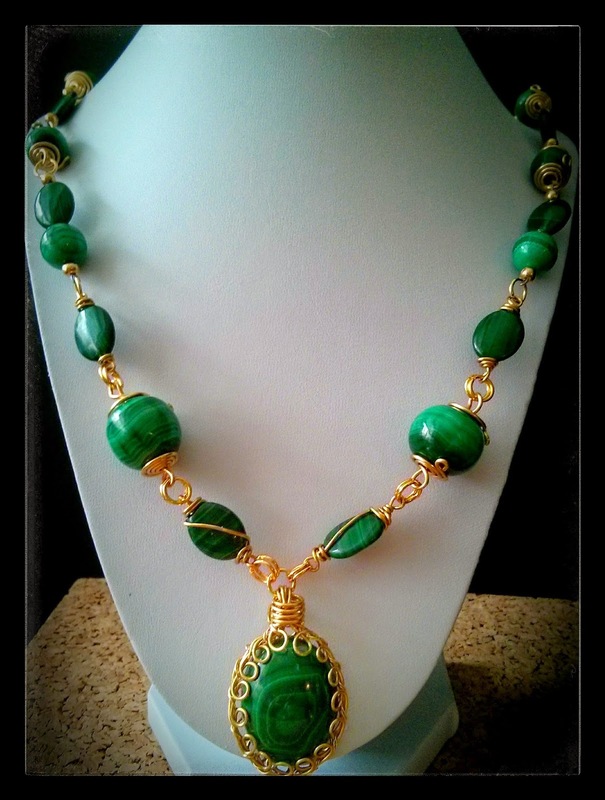 Magnificent royal Malachite necklace. Malachite, with its beautiful, rich green color, leaves no doubt of its importance as a jewel. Its opaque strength and power demands respect, mesmerizing the viewer. Yet the movement, flow and energy in its lines, circles and designs soothe and welcome. It is spiritually inviting. Malachite has been called the "mirror of the soul. It is so beautiful that one would like to wear it in jewelry, but caution must be used when wearing Malachite. It will always reflect how you feel, if you feel negative don't wear Malachite. Large quantities of malachite have been mined in the Urals, Russia. Currently, the mining of the Ural malachite completely stopped. According to an eminent scientist-mineralogist G.N Vertushkova on the Urals possible discovery of new deposits of malachite. It is found worldwide including in the Democratic Republic of Congo; Gabon; Zambia; Tsumeb, Namibia; Mexico; Broken Hill, New South Wales; Lyon, France; Timna Valley, Israel; and the Southwestern United States, most notably in Arizona. Ancient Egyptians, Greeks and Romans used malachite for jewelry and ground it to use as eye shadow. 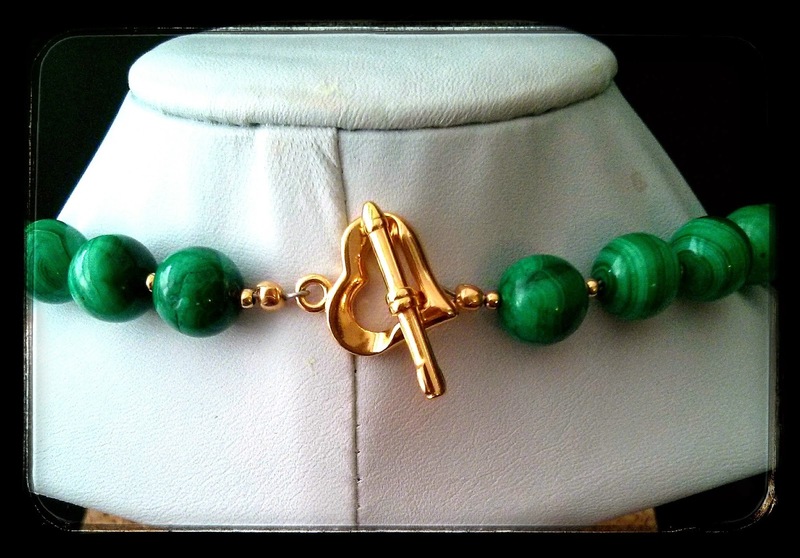 This gold plated and Malachite necklace was a custom made order. It's 22'' long and handwrapped in gold platted copper wire. The findings are goldplated. It is made of 1,5'' Malachite cabochon, two 16mm round beads, sixteen 12mm round beads, eight oval beads. Malachite hardness on Moch scale is 3,5-4, so it should be worn and stored with care. Beautiful golden Honey Jade colored 10mm stone beads. Deep pale yellow color with some white inclusions. These beads have not been polished and have a matte finish. Oval Orange Aventurine cabachon pendant with sterling silver setting ringed in a sterling silver bezel. The pendant is in deep peach color. Flat back. Hangs from oval sterling silver bail. Measurements: Total length of pendant is approximately 37mm. Oval is approximately 26mm long, 21mm wide, 9mm thick. The necklace is 18'' long, finished with silver plated clasp. Only $45 + shipping and handling. 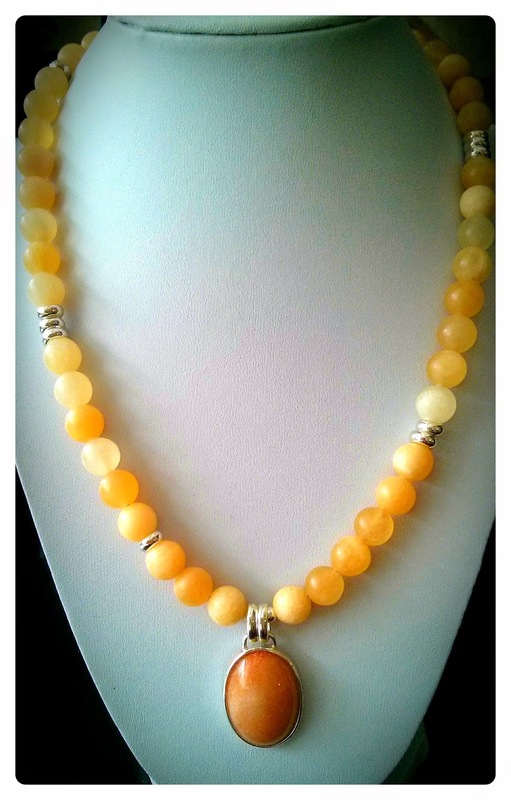 Orange Aventurine is considered a stone of good luck, fortune, and a manifestor of exciting new possibilities. It has been called the "Whisper Stone" since the energy of this stone helps to quiet the critical and judgmental inner voice. 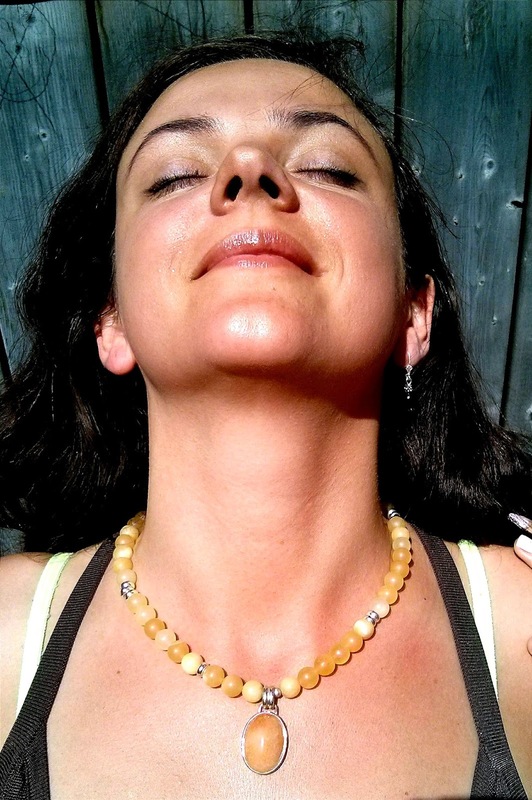 Orange Peach Aventurine is said to help with decision making and boosts creativity. Honey Jade is actually a variety of semi-translucent golden Jasper with a very similar look and mineral composition to Jade. Honey Jade is believed to be a powerful emotional balancing stone.